Only plans for this week are for a game of Command & Colors: Napoleonics. Ross will run an epic scenario covering the 1809 action around Aspern-Essling between the French & Austrians. The Epic format allows for up to 8 players so plenty of room for everyone to join in. This also leaves plenty of table space should anyone else fancy putting something else on. Quintilius Varus was at the head of three legions plus a number of auxiliaries on the Visurgis (Weser) river that marched westwards to their winter quarters at Aliso on the Lippe river. The heavy rains and the 10,000 non-combatants slowed down the march. The column totalled about 20,000. A German auxiliary group, commanded by Arminius, prepared a cunning plan to ambush Varus. Armenius informed him about a small uprising in the forest and Varus prepared to crush it. Friendly German tribesmen told Varus that it was a trap but he believed his young protégé, who promptly deserted and massacred a Roman detachment. This was a signal for a running battle of several days. The Romans bravely tried to cut their way out northwards but the German tribes eventually broke into their formations, annihilating them. Nearly all the women and children were massacred but a few legionaries survived to tell the story. Varus and his officers, all wounded, killed themselves. The disaster had a profound impact on the embryonic Roman Empire. Apparently, it became an obsession with Caesar Augustus, who frequently burst into tears bellowing, “Varus, give me back my Legions!” Recently, archaeologists discovered hordes of silver (probably soldier’s pay) in the region. An average die was used to control the mustering of the tribal warbands on the flanks of the column. The Roman commander’s eyes explored the carpet when a ‘5’ unerringly turned its way upwards on the pristine green cloth soon to be stained by Roman blood and gore. The legionaries had just been paid, so the word soon got around the German shop floor that performance related pay was on offer. To begin with, the Romans and their loyal auxiliaries made a good account of themselves, driving back a number of warbands into the woods but a head-on attack, aided by some favourable dice, caused chaos. A Roman cavalry charge wiped out the leading warband in the closing stages and brought about some relief from the pursuit of the yelling tribesmen but there was no doubt about the future of Varus’s column. 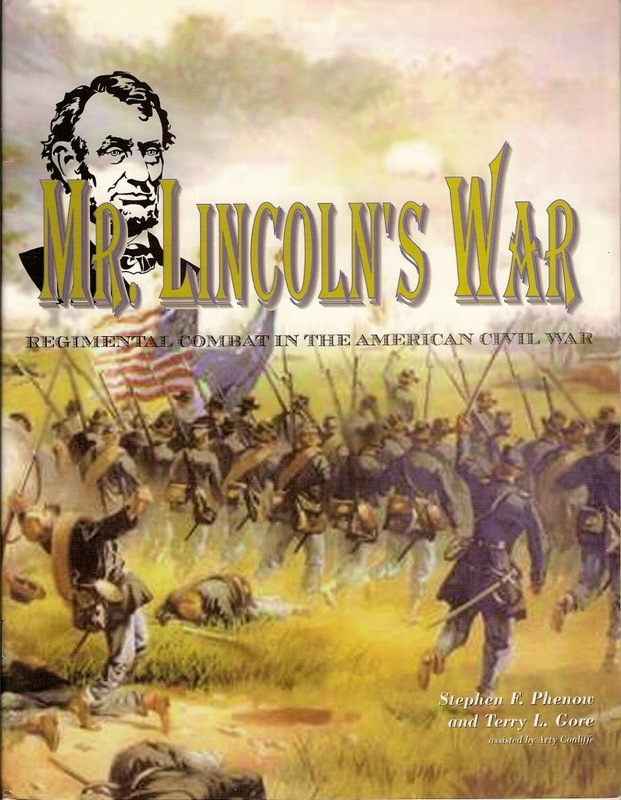 John and Stuart will be putting on a 28mm American Civil War action using “Mr Lincoln’s War” – designed to cover regimental level battles. Plenty of space for folks to join in. 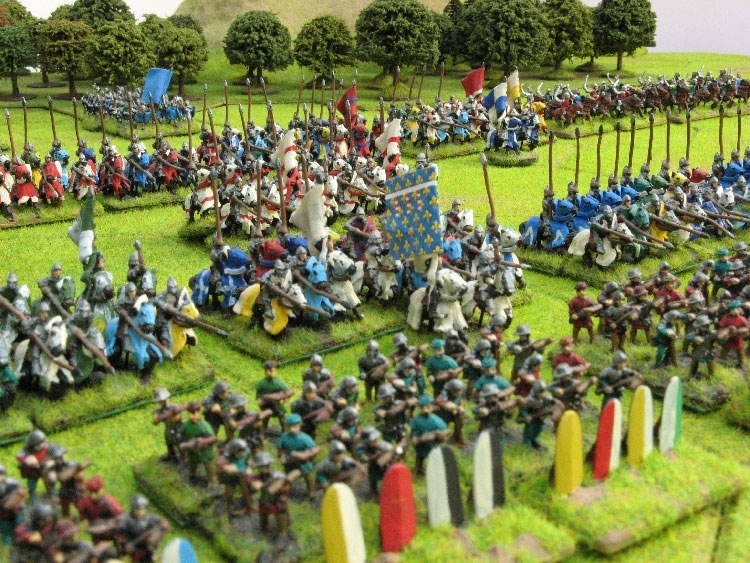 Mike and Ross will be playing a Wars of the Roses scenario using Kallistra’s “Hordes & Heroes” ruleset. These games should allow space for another small game should folks want to put something else on. 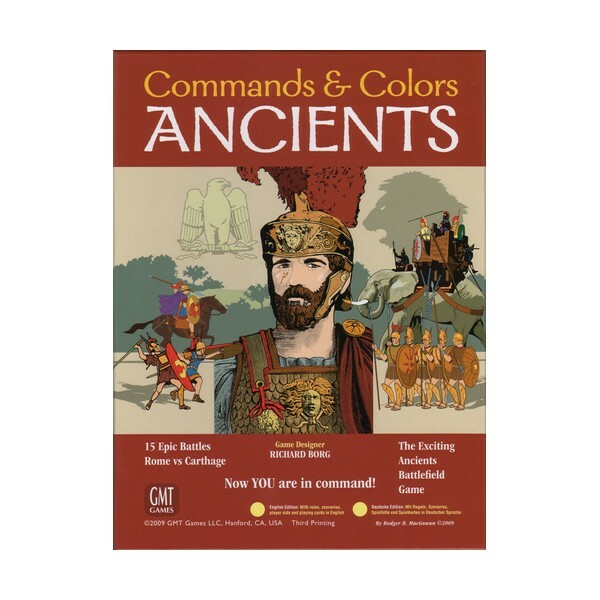 Mike will run a Command & Colors: Ancients epic game. The scenario will be chosen on the night. This boardgame by GMT Games allows for up to 8 players so plenty of space if you want to join in. This leaves plenty of space should anyone else fancy putting on a game this week. 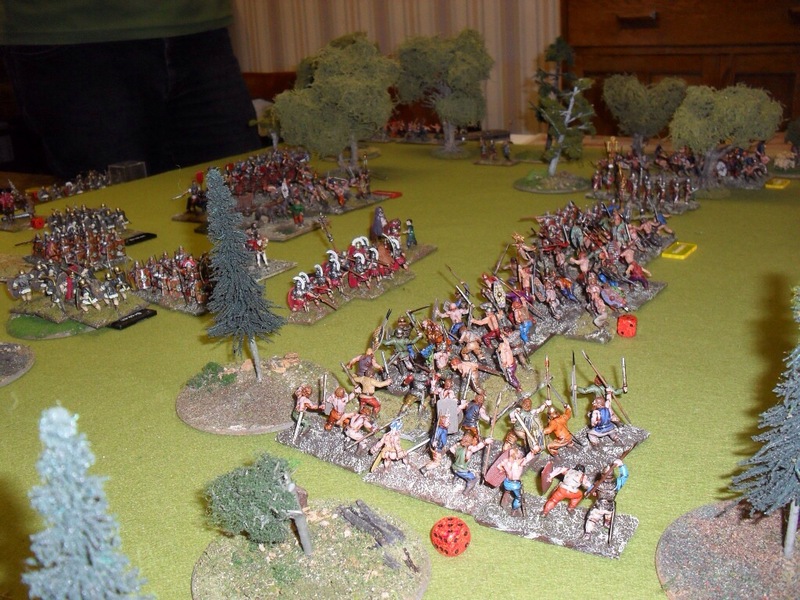 This month Mike will put on a 28mm Romans v Celts game using Field of Glory rules. There will also be plenty of space for others to put on a game too should they wish.